I think this sums up how I feel about bringing up my children. 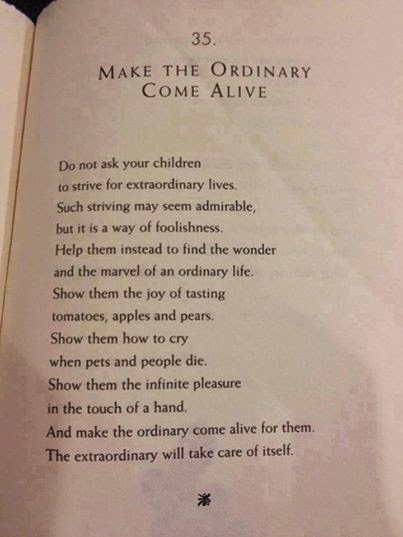 It's by William Martin from a book called "The Parent's Tao Te Ching: Ancient Advice for Modern Parents"
I think your girls will grow up to be just great anyway, how could they not with a dad like you? Well done Kev! Ah, but you only see the good bits! I've plenty of bad habits and faults as well! Thank you though! I agree, too often today kids are pushed and pushed to strive for best results and have no real childhood. One of my Great Nephews sat something like 18 GCSE's this Spring. So he spent such a lot of time studying, researching and revising. I didn't do my '0 levels' until my late teens after I left home, part-time on a Mature Student course. I had to work very hard outside of college to earn enough money to pay rent,food,clothing. But at least I had a childhood, not all good memories but, adventurous! I remember saying to my parents about the importance of GSCEs when I was taking them. It had been drummed into us that it was the most important time of our lifes. Turns out it wasn't, I think the only time I needed them was to get into sixth form so I could do A levels which turned out to useless as well! Thanks Gorges, sometimes I think we all over complicate the world and it's much better to enjoy the simple things. "Show them how to cry when pets and people die." Wonderful advice. Don't worry about going off topic Kev. Write about what concerns and interest you. I just thought that this was lovely and wanted to share it with you all. What lovely words of advice, which you are following to the letter, so well done you, Kev. Your girls will grow up to become very grounded adults, and that is the best gift you could ever give them. I hope they do, they'll probably rebel against me at some point and wish they lived in the town to be close to there friends but until then! I know what you mean. When I read it I had to re read it a couple of times and let it sink in. Such a good poem. I had to write to my eldest son's teacher when she kept pushing him. I told her I didn't care what he was when he grew up as long as he was happy. In fact he went on to be an air traffic controller but I would have been just as happy for him to have been a road sweeper. A good simple childhood stays with you for all of your life. I think thats just it. I remember being asked to leave an assemble with two others as we didn't want to go to uni. We had to get up and walk out in front of a couple of hundred other kids. The walk of shame! I made the right choice though, a trade is something will be useful for the rest of my life. I think it is all about motivation. If the kid is interested they can do amazing things. I think you're right. I always say I'm a geek about certain things, self sufficiency and carpentry. It's those things that I do well in because I'm interested in them. Shame it's not the stock market or something! What good advice, I'll pinch this photo if you don't mind and stick it on my Facebook page, I have someone in the family who should 'read and heed'. Please do. It's not my poem so make sure you give credit to the writer. What a lovely post. And so relevant today as we just received GCSE results. It was well timed but I didn't realise until afterwards! Ah....just perfect!! I think we are living that poem . Life is short and what matters is getting joy out of it. I share your philosophy on that.